Here’s a tip, for anyone seriously interested in the big issues that will dominate discussion in the next 5-10 years. You should become familiar (if you’re not already) with the work of Jamais Cascio. Jamais is someone who consistently has deep, interesting, and challenging things to say about the large changes that are likely to sweep over the planet in the decades ahead. In 2003, Jamais co-founded WorldChanging.com, a website dedicated to finding and calling attention to models, tools and ideas for building a “bright green” future. In March, 2006, he started Open the Future. One topic that Jamais has often addressed is geoengineering – sometimes also called “climate engineering”, “planetary engineering”, or “terraforming”. Geoengineering covers a range of large-scale projects that could, conceivably, be deployed to head-off the effects of runaway global warming. Examples include launching large mirrors into space to reflect sunlight away from the earth, injecting sulphate particles into the stratosphere, brightening clouds or deserts to increase their reflectivity, and extracting greenhouse gases from the atmosphere. It’s a thoroughly controversial topic. But Jamais treads skilfully and thoughtfully through the controversies. 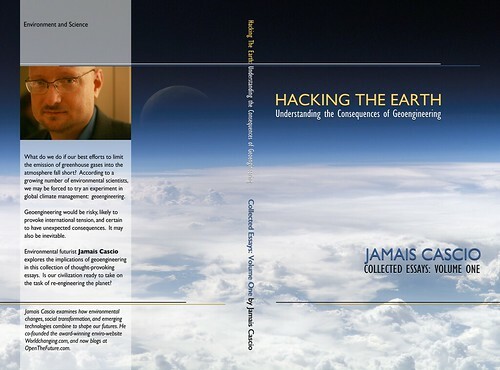 A collection of essays by Jamais on the topic of geoengineering is available in book format, under the title “Hacking the earth: understanding the consequences of geoengineering“. It’s a slim volume, with just over 100 pages, but it packs lots of big thoughts. While reading, I found myself nodding in agreement throughout the book. … in recent weeks various friends have tried out – and given high marks to – web-based self-publishing outfits like Lulu.com… I thought I’d give this method a shot. Feedback effects ranging from methane released from melting permafrost to carbon emissions from decaying remnants of forests devoured by pine beetles risk boosting greenhouse gases faster than natural compensation mechanisms can handle. The accumulation of non-linear drivers can lead to “tipping point” events causing functionally irreversible changes to geophysical systems (such as massive sea-level increases). Some of these can have feedback effects of their own, such as the elimination of ice caps reducing global albedo, thereby accelerating heating. None of the bright green solutions — ultra-efficient buildings and vehicles, top-to-bottom urban redesigns, local foods, renewable energy systems, and the like — will do anything to reduce the anthropogenic greenhouse gases that have already been emitted. The best result we get is stabilizing at an already high greenhouse gas level. And because of ocean thermal inertia and other big, slow climate effects, the Earth will continue to warm for a couple of decades even after we stop all greenhouse gas emissions. Transforming our civilization into a bright green wonderland won’t be easy, and under even the most optimistic estimates will take at least a decade; by the time we finally stop putting out additional greenhouse gases, we could well have gone past a point where globally disastrous results are inevitable. In fact, given the complexity of climate feedback systems, we may already have passed such a tipping point, even if we stopped all emissions today. Geoengineering, should it be tried, would not be a replacement for making the economic, social, and technological changes needed to eliminate anthropogenic greenhouse gases. It would only be a way of giving us more time to make those changes. It’s not an either-or situation; geo is a last-ditch prop for making sure that we can do what needs to be done. We don’t know enough about how the various geoengineering proposals would play out to make a persuasive case for trying any of them. There needs to be far more study before making any even moderate-scale experimental effort. This is not something to try today. The most important task for current geoengineering research is to identify the approaches that might look attractive at first, but have devastating results — we need to know what we should avoid even if desperate. Like it or not, we’ve entered the era of intentional geoengineering. The people who believe that (re)terraforming is a bad idea need to be part of the discussion about specific proposals, not simply sources of blanket condemnations. We need their insights and intelligence. The best way to make that happen, the best way to make sure that any terraforming effort leads to a global benefit, not harm, is to open the process of studying and developing geotechnological tools. Geoengineering presents more than just an environmental question. It also presents a geopolitical dilemma. With processes of this magnitude and degree of uncertainty, countries would inevitably argue over control, costs, and liability for mistakes. More troubling, however, is the possibility that states may decide to use geoengineering efforts and technologies as weapons. Two factors make this a danger we dismiss at our peril: the unequal impact of climate changes, and the ability of small states and even nonstate actors to attempt geoengineering. It is possible that, should the international community refrain from geoengineering strategies, one or more smaller, non-hegemonic, actors could undertake geoengineering projects of their own. This could be out of a legitimate fear that prevention and mitigation strategies would be insufficient, out of a disagreement with the consensus over geoengineering safety or results, or—most troublingly—out of a desire to use geoengineering tools to achieve a relative increase in competitive power over adversaries. I particularly liked Jamais’ suggestion of a “Reversibility Principle” as an alternative to the “Precautionary Principle” and “Proactionary Principle” that have previously been suggested as guidelines for deciding which actions to take, regarding the application of technology. Geoengineering is, by its nature, a huge topic. The “Technology Review” magazine contains a substantial analysis entitled “The Geoengineering Gambit” in its Jan-Feb 2010 edition. And the authors of Freakonomics, Stephen J Dubner and Steven Levitt, included a chapter on geoengineering in their follow-up book, “Superfreakonomics“. As it happens, there seems to be wide consensus that the freakonomics team were considerably too hasty in their analysis – see for example the Guardian article “Why Superfreakonomics’ authors are wrong on geo-engineering“. But the fact that there were mistakes in that analysis doesn’t mean the topic itself should fade from view. Far from it: I’m sure we’re going to be hearing more and more about geoengineering. It deserves our attention! Many thanks for this. I am considering doing some of my own research into geoengineering as well. May be worth us discussing at some point. I’ve got a few more geoengineering articles in my inbox to read soon; I’m hoping to make another post after that. I’ll be happy to compare notes with you! I did not know about Jamais Cascio’s book, I have just ordered a copy and I look forward to reading it. Thanks for that. When considering the potential dangers of geoengineering, I think it is worth making a distinction between the two types of geoengineering being considered. This includes reforestation/afforestation, using biomass to generate energy and then capturing and storing the CO2 emissions (BECS), creating and using biochar (e.g. in agriculture), various kinds ocean fertilisation and finally building machines to chemically extract CO2 from the atmosphere (see the work of Klaus Lackner and David Keith). The aim here is to remove the CO2 humans have introduced into the atmosphere over the last 150 years or so (i.e. reversing the unintentional geoengineering we have already done). The atmospheric CO2 concentration has been varying naturally between 180ppm and 280ppm with a period of about 100000 years for at least the last 600000 years, the system behaves predictably at these concentrations and I can think of no reason why directly removing the CO2 we have introduced into the atmosphere in order to return the CO2 concentration to its pre-industrial level would, in itself, have negative consequences (of course if we are already committed to crossing a tipping point, removing CO2 may not be very effective). The methods used to remove the CO2 may create secondary problems, of the options listed above, ocean fertilisation is the most unpredictable (e.g. it is uncertain how the creation of large algal blooms in the oceans may impact the aquatic ecosystem). There are also some predictable issues: the various kinds of biological capture have a large land footprint, so may conflict with food production, human settlements etc. Chemical capture with machines is likely to be expensive and may require a lot of water, but the research is still in its infancy. This type of geoengineering could fix the global warming problem permanently and it could be done in a way that has a predictable, safe and controllable outcome. The problem is, it is likely to be very expensive and slow. This includes mirrors in space, seeding clouds, placing particles in the stratosphere etc (lots of ideas in this group). I think this type of geoengineering is much more problematic. Incident solar radiation drives weather patterns and is the primary source of energy for all life on Earth (with the exception of hydrothermal vents :o). Here we are interfering with a much more complex set of relationships and the consequences could be very difficult to predict (i.e. it’s a dodgy hack). There could also be political problems associated with these options, i.e. who controls them? Could they be used for political gain? Many of these option have the potential to be used as weapons of mass destruction. This type of geoengineering may offer a relatively inexpensive way of quickly controlling the global temperature increase, but it is not a permanent solution, it addresses the symptoms not the cause and may have dangerous, unpredictable and possibly irreversible consequences. It seems to me that type 1 and type 2 geoengineering options are significantly different both terms of the dangers they pose and in the roles they could play in helping to control global warming. Type 1 could be used proactively, working alongside emissions cuts to help control the global temperature increase. Once CO2 emissions have stopped or are significantly reduced, type 1 geoengineering has the potential to then reduce the global temperature. Type 2 options are more a solution of last resort. In the case of catastrophic global warming, type 2 geoengineering could act as a shield, halting the global temperature increase for long enough for type 1 geoengineering to return the atmospheric CO2 concentration to a safe level. I’m looking forward to your future postings on this subject, exciting!